Unfortunately, due to the fact that many of us do not understand koiné Greek we are unaware of many grammatical principles which alter the understanding of some verses when translated into the English vernacular. In Koiné Greek, verbs ending in “oo” indicate that what is already on the inside is then displayed on the outside (which is not the same as asserting that what is seen on the outside creates what is on the inside, in fact it is antithetical to this). Due to not being aware of this Greek grammatical principle divisions have been created within the English-speaking church, to the extent that denominations have been severed concerning such teaching as “works as a part of faith,” as opposed to “faith alone” regarding salvation, as well as the Christian walk. James is not saying that Abraham’s works made him justified before God, but that Abraham’s works were the outside manifestation of what had already taken place on the inside, Abraham was already justified by God prior to this event. 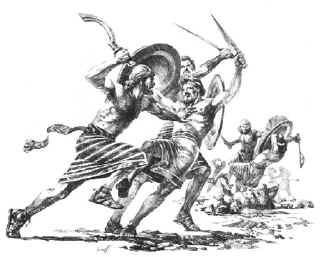 Therefore, it is impossible for James to be stating that Abraham was saved by faith when he offered up Isaac more than forty years after Genesis 15:6, which is when he displayed saving faith (in which God counted it as righteousness) by believing God’s promise concerning becoming a mighty nation, by first having a physical son of his own. What is easily understood especially in light of the Greek grammatical principle concerning Greek verbs ending in “oo”, is that James is stating that what was already on the inside of Abraham, saving faith in God, was fully displayed in the act of him being prepared to take the life of his son according to God’s direction. Here, Paul is quoting from Genesis 15:6, when Abraham was around 85 years old, and is being justified according to his faith by God. Paul uses the same Greek verb for justifieth, indicating that he then was exercising that faith that had already dwelt on the inside concern in God and his promises. We must remember that it was God that ten years before had instructed Abram to leave his home and relatives to go to a new land that God would later show him. Abram delayed his departure until his father had died (according to Stephen ~ Acts 7:4), then disobeyed God by taking his nephew Lot with him. So though Abraham had faith in God, it had not matured to the place of confidence that would mandate obedience. Yet, the scripture is quick to tell us that it was his belief in God’s promise, not Abrams works wherein God saw his heart and imputed righteousness to him. Therefore, what James says in James 2:21; agrees with Paul says in Romans 4:1-11 (as well as Ephesians 2:8-9); whereas James states that Abraham displayed (what was on the inside was exhibited on the outside) his saving faith by his work (deed), of trusting God when he was preparing to present his son as a sacrifice, this was 40-50 years after he was already saved by his faith in God as recorded in Genesis 15:6 (Paul states in Romans 4:3; 4:9; Galatians 3:6, that Abraham received his salvation when he first exercised faith back at Genesis 15:6), and Paul stated Abraham it was this same faith that was counted for righteousness unto salvation. James says the act displayed what was already on the inside, and Paul that the inside created the act that was displayed on the outside. Matthew 17:2, regarding the Transfiguration of Christ, where the word: “transfigure“ (Greek: metamorphoo), means to change the appearance or form, yet it does not denote the change of the substance of that thing, but simply its appearance (with the use of this word, transfigure, we are forced to focus on Christ’s physical appearance). And with the verb utilizing the “oo,” ending we further understand that the change referred to here is to display the radiance of his glory physically, exhibiting what is already on the inside, to the outside, which is Christ’s Divinity in visible form. Ephesians 3:16, concerning the word: strengthened (Greek: krataioo – see Endnote #1), concerning the believers who have been strengthened on the inside by the Holy Spirit which should be exhibited on the outside. What we must also understand concerning this word, strengthened (noticed that it is past tense in the English), is that in the Greek grammar, it is in the passive voice, meaning that the person receives the power from another, not from themselves; and that it is in the aorist tense, meaning that the action occurred in the past (it occurred “Once & for all.” The action occurred or was made possible when Jesus died on the cross, giving the opportunity for the Holy Spirit to indwell the believers according to salvation as adopted sons of God) and it is in the indicative mood, meaning that it is a complete certainty (A reality ~ it is a done deal, completed). These types of passages which use Greek verbs ending in “oo” are simply stating the fact that the outside is showing what is already going on the inside (they are not saying that there is only an exterior application, but that there is an interior meaning that is expressed in the exterior as well – see Endnot #2). 1. If you use a Greek Parallel Interlinear New Testament, you will notice that the spelling for the verbs referenced above (justification, transfigured, dwelt, and strengthened) in the Greek language do not display two “oo,” just one. This is because in a Greek Parallel Interlinear New Testament, the Greek words are combined into cognates and not distinguished individually. However, if you utilize a Bible Dictionary on Greek (Such as: Vine’s Expository Dictionary of Old and New Testament Words; Expository Dictionary of Bible Words, Larry Richards; Jamieson, Fausset, Brown; Word Studies in the Greek New Testament, Kenneth S. Wuest; Word Meanings in the New Testament, Ralph Earl; Hebrew-Greek Key Study Bible & Word Studies, Spiros Zodhiates), as well as any of the current computer dictionary programs; the spelling of the individual words will be with the double “oo” ending. Thayer’s Greek Dictionary is used concerning the above translation (This may not apply to certain deviant Alexandrian Codex utilized in a few of the modern translations; these text also modify passages concerning the Deity of Christ, and other Orthodox doctrines, yet they are unable to delete all scriptural basis for these doctrines, as even these deviant translations cannot completely change the Greek wording. If any of your current Bible translations omit the double “oo“, please forward this to me, and I will personally give you background information for greater clarity, and also I am doing ongoing research concerning these deviant Alexandrian Codices, as well as any Word Studies or Dictionaries which utilize them for their source material New Testament translations). 2. Concerning grammatical reference to the utilization of “oo” in Greek verbs wherein its usage “indicates that what is already present on the inside is then displayed on the outside;” Dr. Wayne A. Barber’s book, “The Surrendered Walk,” page 28 gives reference, as well as other books and manuals which teach Koiné Greek. Keep up the great work! You realize, lots of individuals are looking round for this information, you could help them greatly.